With some truly fantastic releases recently, the UK has fallen head over heels for the 50p, with many collectors focusing on hunting down these seven sided gems for their collection. So why should you be collecting £2 coins? In this blog, we’ll take a look at which rare coins should take pride of place in your collection, which potential error coins might be out there and we’ll also share with you our top three £2 coins to look out for. The 2002 Commonwealth Games England £2 Coin is officially the most scarce £2 coin in the UK, ranking as 100 on our Scarcity Index. Four coins were released in 2002 to celebrate the Commonwealth Games and at first glance, you might struggle to spot the difference between them. They all feature the same running athlete trailing a banner behind. But each has a different cameo, representing each of the four constituent parts of the United Kingdom. The fact that this coin is so hard to spot and has such a low mintage of just 485,500 means that the Commonwealth Games NI £2 is the holy grail of £2 coin collections. It wasn’t until 2016, when The Mint released the mintage figures for the 2015 coins, that collectors realised just how special the new definitive £2 coin was. Only 650,000 of the 2015 date Britannia £2 coins had been stuck for circulation, making it one of the most scarce UK £2 coins ever issued! So scarce in fact that there were fewer of this coin than the England and the Scotland coins from the famous 2002 Commonwealth Games series. 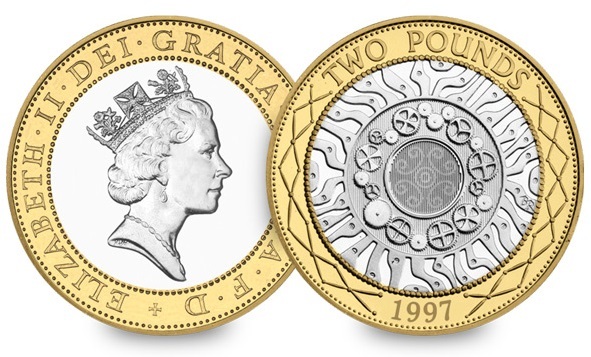 This makes the 2015 Britannia £2 joint third scarcest £2 coin in circulation, alongside the Navy £2. First discovered by a Change Checker, and later confirmed as a genuine error by The Royal Mint, this unusual strike appears on a handful of the 2015 Britannia £2 Coins. The Royal Mint has accounted for the seemingly impossible misalignment of the Queen’s effigy as “almost certainly the result of one of the dies working loose and rotating during the striking process”. The result is that the Queen’s head is offset by around 150 degrees compared to the Britannia design on the reverse of the coin. We analysed 5,000 circulation Britannia £2 coins and our results suggested that the Inverted Effigy may have affected as few as 1 in 200 of the coins struck – in other words around just 3,250 coins. The original Navy £2 design (left) shows the coin without any markings on the top right of the mast, but the coin on the right looks like it has a flying flag. The Royal Mint strike up to 5 billion coins a year and from time to time debris can get caught between the die and the coin whilst striking. It just so happens that this bit of debris has caused the markings on these coins to look like a flying flag on the ship – fuelling speculation that two different variations were struck. Whilst it doesn’t add any extra value to the coin, it’s certainly one to look out for and makes for interesting collecting. There is a misconception that there were two types of the Abolition of Slavery £2 coin struck for circulation. It is true that two versions of the coins exist – one has a textured finish whereas the other has a smooth finish and features the artist, David Gentleman’s initials (circled). The key difference is that only the textured version was struck for circulation, and if you find one of the smoother types in your change, you have actually found a coin which has been taken out of a presentation pack. This makes it considerably rarer than the circulating version, so it is worth keeping rather than spending! When it comes to collecting, £2 coins are some of our favourites to look out for, but out of the rare and wonderful coins mentioned above, here are our top three £2 coins to collect. 1) It’s no surprise that the UK’s scarcest £2 coin in circulation should come in first place, but you’ll not only have to be very lucky to come across one, you’ll also have to be eagle eyed to spot the correct flag for the Commonwealth Games Northern Ireland £2 coin. 2) Coming in close second is the third scarcest £2 coin, but can you challenge yourself to see if you can find one with the ‘flag’ variation as mentioned above? 3) And as our third placed coin, the 2015 Britannia actually sits in joint third place as the UK’s scarcest £2 in circulation and our challenge to you is to try and find the inverted effigy of this coin too! You may have noticed a lack of 2017 coins in your change, as to date The Royal Mint haven’t confirmed if they will enter circulation. This all depends on demand for specific denominations at the time as UK Banks and Post Offices may not request every denomination every year if there is already sufficient coin in circulation. All of these coins are available to purchase in Brilliant Uncirculated quality here, but we will of course be the first to update you as soon as we have more information on their potential release. It can be quite a challenge tracking down every single £2 coin for a complete collection. Remember, if you’re struggling to find those last few coins in your change, you can source them online, in auctions, on Facebook coin groups and of course by swapping with like-minded collectors on our web app. I have got a 1998 bailiwick of jersey £2 coin with the inverted edge inscription.Is this rare? Hi Paul, is your coin all gold or has the silver centre come out? You’ll sometimes find coins in circulation that have been tampered with by people looking to claim it is a fake. It is relatively easy to prize the two parts of metal apart by freezing the coin and using a chisel to knock the middle section out. Unfortunately this isn’t an error and won’t add any value to the coin. I got a Jane Austen 2017 £2 coin in my change just before Christmas that year and I’ve been holding on to it ever since. Only 1860 went in to circulation according to the Royal Mint! That’s incredibly lucky! Such a small amount were released as part of a promotional event so it’s great that one has managed to find its way to you. I have a 10 pound bite dated 2016 beginning with AA01 is it worth nowt. The reason your not seeing the A-Z 10p’s, are that the post office and bank staff are keeping them to themselves then selling them on ebay as sealed bags obviously for a premium.. The A-Z 10p coins were released by The Royal Mint last year. There are 26 designs (one for each letter of the alphabet), each featuring a Great British icon. Well done for finding one! Which letter do you have? The Kew Gardens 50p is currently selling on eBay for £97. Yes I am interested in your coins how much you selling them? Hi Jason, to get a better understanding of this coin would you be able to send a picture to info@changechecker.org please? proof coins so it may interest other collectors to know that there are actually 3 type of 2007 Slavery £2 coins the two as you said and a proof coin the same as the uncirculated coin but with a smooth frosted finish, and just to add salt to the wound a forth does exist with a wrong edge inscription and is a unique coin. I have been collecting £2 for a long time now which includes all the right way up and up side down edge inscriptions and there are 159 so far and the only one I am missing is the inverted Britannia. Thanks Les, it sounds like you’ve got a very comprehensive collection. Great work! Do you think the 2017 coins will ever enter circulation? The fact that many 50p and £2 designs are not being released into general circulation has really taken the joy out of coin collecting for me; they are so expensive to buy in BU form and yet to gain a full set of coins, you have to. The 2017 £2s have now sold out via Royal Mint and at that point Westminster put them up from £8.99 to £12.99 for a £2 face value coin, so it is putting them out of reach of the casual collector. Hi Darren, it’s looking more and more unlikely, which is a real shame as their have been some lovely £2 designs recently which we’d love to see in our change. The Royal Mint doesn’t actually decide which coins go into circulation, as this is based on demand from banks, post offices and cash distribution centres. Demand at the moment must be low, but hopefully we’ll see some of the coins issued this year released for circulation. The 2015 £2 with flag or “cat on the mast” error both sell for a slight premium on eBay. It is not true to suggest that the error 2015 Britannia can only be found with a 150 degree die rotation, as I have 25,70 and 165 degree rotation coins in my collection, as well as the 150. Also, why no mention of the rare 2010 doubled die £2? 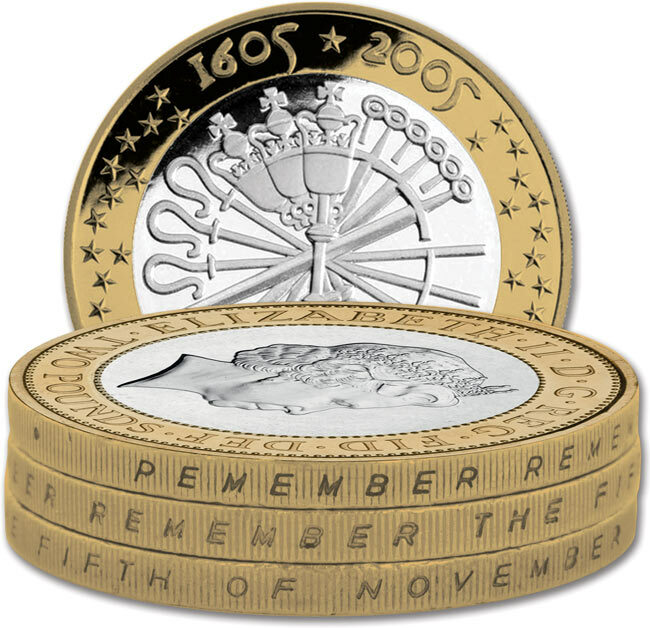 As for the 2005 “Pemember Pemember” coin, the Royal Mint explanation is nonsense, the problem is actually a damaged collar. It sounds like you’ve come across some very interesting error coins Stephen! As to be expected with the mass production process, there are many different variations in how coins are struck and this makes for really interesting collecting. The fact that so many of the coins are not in circulation and more than likely never will be is killing the hobby for me. I got into this hobby because of the fun of finding coins in your change. It is the same with the A to Z 10p coins. From a very wide social and work circle, not one person has seen or knows a person who has seen one of these 10p’s in their change. Great find, well done Alan! Hi i have a charles dickens 2 pound coin dated 2016 is this worth anything. Enjoyed that, didn’t know about the slavery coin, will have to check. Thank you.